Car cleaning products make up a huge part of the detailing products market. Finding the best car interior cleaner does not need to be difficult. 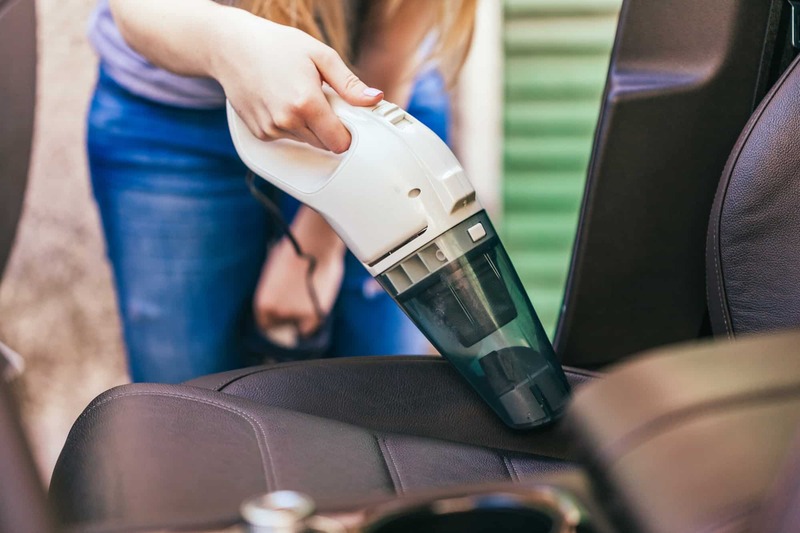 Cleaning the inside of your car is much the same as cleaning the inside of your home. 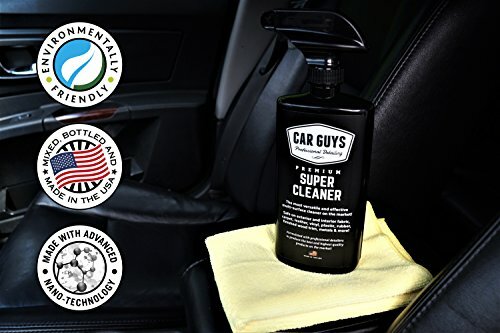 One of the best all round interior cleaners you can get today is CarGuys Super Cleaner. Check out this and all of the other recommended cleaners in our detailed reviews below. 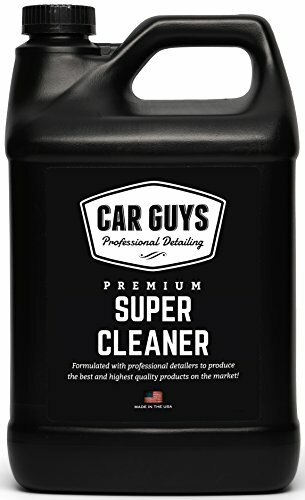 Car Guys Super Cleaner is a favourite all rounder of mine. 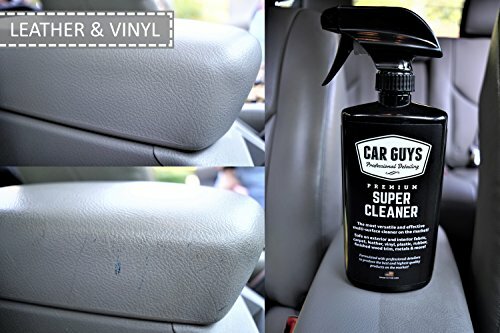 It's perfect for cleaning almost every surface in your car’s interior. It can be used on anything from carpet, upholstery, canvas, awning fabric, PU, faux leather, vinyl, plastic, rubber, finished wood trim, and any metals. You can't use it on glass or clear plastic (like the screens on touchscreen displays or over the dashboard instrument panel). How effective is the Car Guys Super Cleaner? It's specially formulated to fight common stains from coffee, ketchup, sauce, milk, gum, chocolate, colored gravy foods, cigarette ashes, and many other foods. This cleaner is a PH balanced cleaner, which safely cleans fabric without causing discoloration. It doesn't leave behind a chemical odour or a protective seal, gloss or film. This is a good thing if you are going to use it regularly, because you don't want to have to spend ages removing a protective coating every time you clean. If you are using this to clean leather or outside trim then you'll need to buy an additional protective coat to protect against UV rays, cracking, fading, and to effectively repel dust. What smell does it leave behind? It leaves a nice faint smell, not too overpowering, but still leaves your car feeling fresh and clean. It also dries out without leaving any stickiness on the seats, dashboard or any surface you've cleaned. Is is easy to apply? Is it concentrated? Before you actually clean your car interior with Car Guys cleaner, make sure you vacuum and remove all the loose dirt and debris away. To apply, shake the bottle, spray it on a microfiber cloth, and wipe it on the surface you want to clean. The cleaner is a non-concentrated, ready to use liquid that you can use directly from the bottle. This stuff will last a long time, a gallon goes a long way. You only need a small amount of this cleaner to give surfaces a good clean. Griot’s Garage Interior cleaner is a premium multi-purpose interior cleaner that can clean pretty much any interior surface. It won't damage the interior of your car and does not contain any nasty chemicals. It also comes in a nicely shaped, easy to hold bottle with a pre-attached spray nozzle and is very easy to use. What Surfaces can You Clean? It's great for removing tough stains and will even remove oily residue without damaging the surface. Even though it's made with strong chemicals, it can handle every kind of mess without leaving any unpleasant chemical odor or unwanted gloss. It acts mildly but effectively to break down stains, and it can degrease and deodorize surfaces easily. Griot’s cleaner leaves zero odor on anything you clean. It dries fairly quickly and within around 5 to 10 minutes you're left with a refreshed and restored car interior. How do you apply it? Is it concentrated? Applying Griot’s cleaner is easy. It is not concentrated so you don’t need to dilute it. Just squeeze the spray bottle lever one or two times, directly on to the surface or cloth and then wipe to clean it. This is a great all rounder. It cleans pretty much any interior surface so it will save you money as you don't need to buy multiple cleaning products. It's also a clear, scent free liquid, so it's not going to damage your car or leave behind any nasty residues. 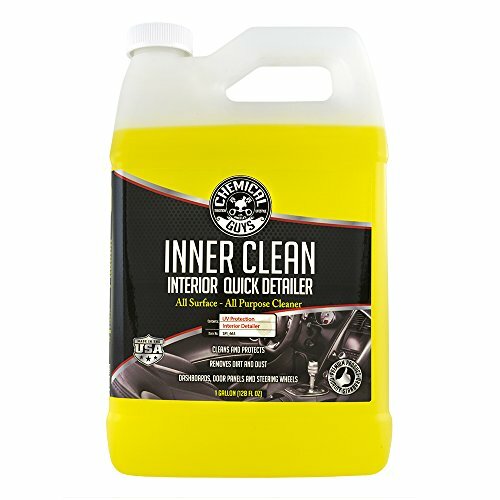 InnerClean from Chemical Guys is a multi-purpose cleaner and detailer. It can be safely used on any interior car surface and leaves behind a clean matte finish and mild pineapple scent. InnerClean is great for cleaning leather, vinyl, rubber, plastic, painted metal and glass. You can safely clean everything from carpet to upholstery, dashboard, steering wheels, navigation screens, wood trim, arm rests, cup holders, seat fabric and more. Unlike some other cleaners we have reviewed, this one leaves behind a matte finish with a protective coating. This means that you're interior is protected from UV discoloration and will repel dust and dirt more effectively. 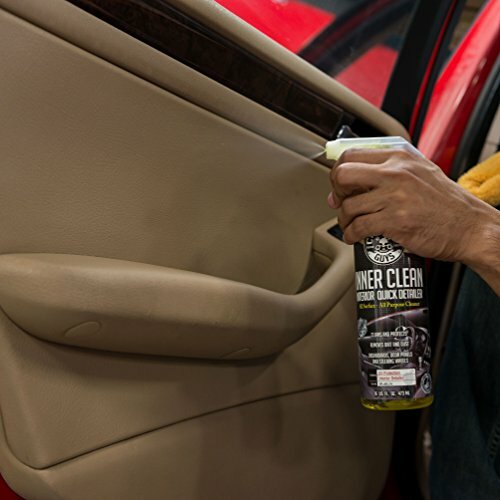 Chemical Guys have added enzyme odor eliminators to help make this an effective odor eliminator. There is also a mild pineapple smell left behind. It's not overly pungent, but it helps to freshen up the interior. Since the cleaner comes in a 1-gallon can, you need to first transfer the required amount to a spray bottle. It's ready to use, so you don’t have to dilute it. To use the cleaner, spray it a few times on a microfiber towel and gently wipe the surface you want to clean. Once you have cleaned the surface, use the clean dry side of the cloth to remove any excess liquid left behind. Chemical Guys make great cleaning and detailing products. This one is a good value interior cleaner. We haven't used it personally but it has gotten lots of great reviews online. On the downside, the matte protectant finish may not be suited to all surfaces. It's also yellow in color, so I'd highly recommend trying a hidden spot first on lighter colored materials. Then there's the pineapple scent. I like fruity scents in cars but it may not be to everyone's taste. 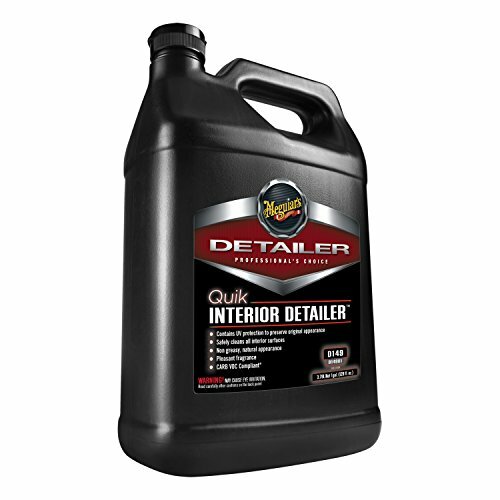 This is another great value product from Meguiar's that helps you to quickly clean the interior of your car or truck. It also contains UV protection agents and leaves behind a matte finish that's clean and fresh. Meguiar's Quik Interior cleaner is another great all round cleaner. It can be safely used on leather, carbon fiber, metal, fiberglass, plastic, rubber, vinyl, and wood. It should effectively remove dirt, grease, fingerprints, spills, ashes, and grime without leaving behind residue or causing discoloration. Plus, unlike the cheap car interior cleaners that just clean, Meguiar’s automatically details the surfaces it cleans. The high lubricity formula revives the natural look of the elements you clean with its UV protectant and anti-wear off coating. It has a unique smell that some associate with alcohol. In the bottle, it smells pretty strong but on applying it turns out to be not that overpowering. It goes away quickly within a few hours and you are left with a fresh and new car smell. The 1 Gallon can in which it comes is great value. It's not a concentrated mix, so you can use it straight out of the bottle. To apply, you're going to need a decent spray bottle. It's easy to use, just spray the liquid over a dry sponge or microfiber cloth and wipe it on the surface you want to clean. For quick detailing jobs you can make up a 50/50 mix with distilled water. This is another good interior cleaner from a leader in detailing products. You can safely use it on most surfaces and it should work out cheaper than supermarket cleaners in the long run. One downside we found is the smell of this stuff when you first spray it on, it's a strong alcohol/vinegar scent and we figure this must be the solvent evaporating as it dries? Anyway, it's not a big problem, the smell dissipates fairly quickly but for those of you looking for a nice fruity scent you're going to be disappointed. 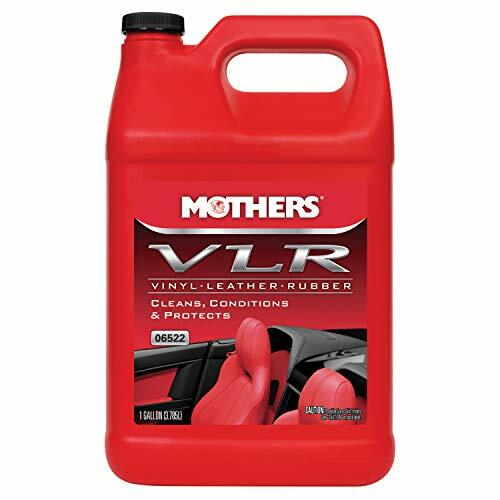 Mothers 06524 VLR is a gentle car interior cleaner for cleaning vinyl, leather and rubber surfaces. As the name suggests, Mothers VLR cleaner is not for cleaning all the surfaces in your car’s interior. It is meant to clean and condition vinyl, leather, and rubber surfaces. This cleaner is safe and gentle PH balanced formula is safe to use on delicate surfaces but is tough on messes, smudges, and smears. It doesn't leave behind a UV protective coating but the infused lanolin and foot oil leaves helps to prevent fading, drying and cracking. The smell is not unlike new leather, but it's not too overpowering and doesn't really last too long. This cleaner is meant to be used directly from the bottle, there's no need to dilute it. To use the cleaner squeeze one or two times onto a cloth and wipe it on the surface you want to clean. For tougher stains, you can also directly spray on the surface and then wipe it using a cloth. Mother's usually deliver excellent car detailing products and this one is no different, if you accept it for what it is. It's not a dedicated leather cleaner, instead it's a quick leather, vinyl and rubber cleaner that does a good job. You'll probably still want to use a dedicated leather cleaner and conditioner a couple of times a year. But for a quick in between cleaner, this one definitely does the job. When it comes to choosing the best car interior cleaner for your needs (because we all have different needs), it's important to keep it as simple as possible. If you think about it, there are lots of different materials used in the interior of vehicles. You don't really want to buy a different cleaner for each one, do you? 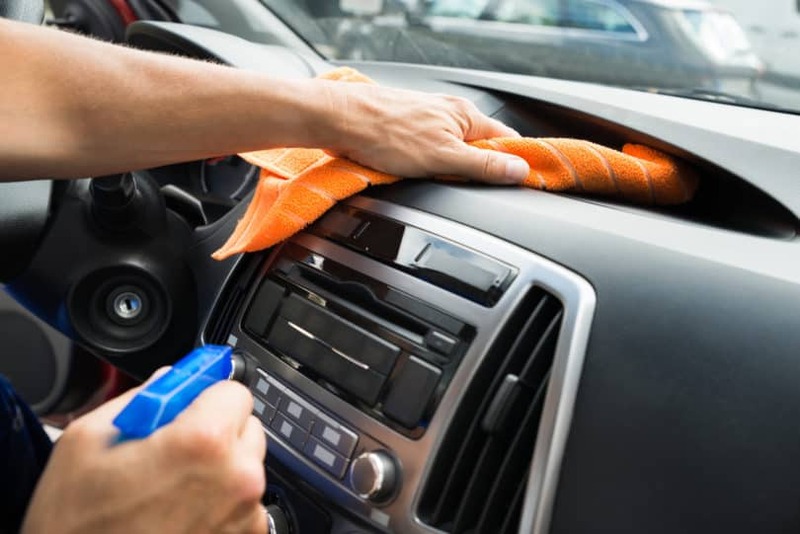 Car interior cleaning is not as difficult as we are led to believe, and usually one product will do the job. There are also lots of products that will help to protect the materials inside your car, and these can help it to stay looking new for longer. With that in mind, here are a few things to think about before choosing a car interior cleaner. 1. Can you use it on all surfaces? 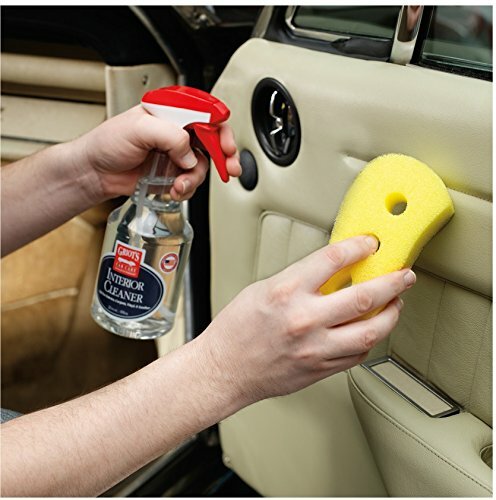 There is a whole range of car interior cleaners that can be used on most interior surfaces. In my opinion, these are a great option as they save you time and money. These cleaners are usually great at maintaining a car interior. They might not be as good at cleaning really dirty or stained surfaces as they are usually designed to be mild enough to use on anything. Some are available in concentrated forms and these can be used at different concentrations for dirtier surfaces. 2. Is it concentrated or diluted? Some of the cleaners I've recommended today are available in big, concentrated containers. These are great if you clean your car a lot, or you're a pro detailer. Concentrated cleaners can also be used undiluted sometimes if you need a really strong cleaner. 3. Does it leave a protective coating? Protective coatings left behind by interior cleaners can be a good thing or a bad thing. I prefer to use separate coatings on selected surfaces as not all surfaces (such as leather) really need a protective coating. In saying this, most of the standard interior cleaners available won't leave much of a protective coating (even if they say they do). Proper protective coatings will need to be applied separately and are usually made from stronger artificially enhanced polymers that cure over time. 4. Does it leave a scent? 5. Is it water based or does it contain oils? If the interior cleaner you are looking at is one that can be used on all surfaces, then there's a good chance it's a PH neutral water based one. These are generally safe to use on any hard or soft surface (although you should always carry out a patch test first!). Some interior cleaners still contain harsh chemicals, oils and sometimes alcohol. These should only be used a few times a year or if you're carrying out a restoration. 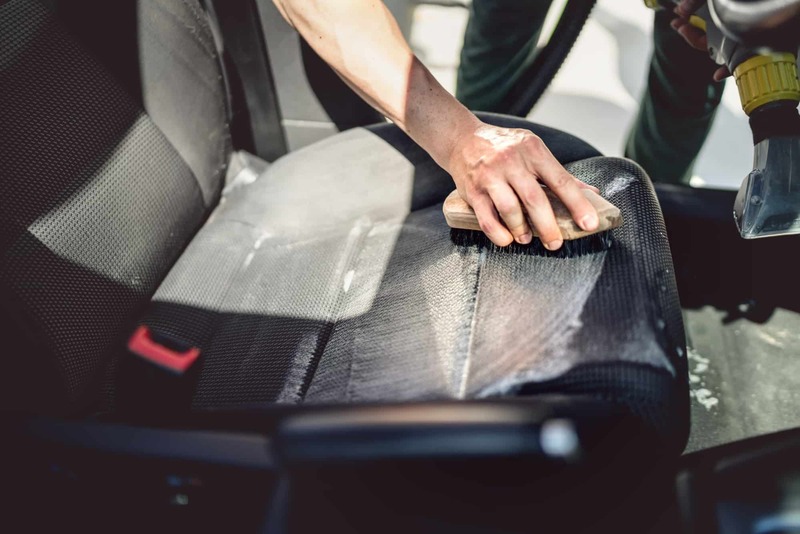 Professional car detailers are masters at keeping vehicles looking like new and there are lots of 'tricks of the trade' when it comes to car interior cleaning. It's not that difficult to get the interior of your car looking like new again with the right tools, a good cleaner and some elbow grease. One of the secrets of cleaning the interior quickly and effectively is to use an all purpose cleaner that you can use regularly and on every surface. This really speeds up the process and keeps the costs down. You don't need to have a garage full of cleaners to get the job done. Before you start cleaning, this is what I usually have ready to use. You won't always need everything on the list, it really depends on how dirty the interior is to begin with. I always start by vacuuming every surface, including the dashboard and under the seats. Be sure to use a soft bristle head so you don't damage or scratch any surfaces. This is a great way to lift the heavy dirt and is an essential step before you start using any cleaners. Remember, it's always better to use plain water or as little cleaner as possible on the interior of your car. This will keep it looking newer for longer. Fill a clean bucket of warm water and get a clean microfibre cloth. If you've got a large bottle of cleaner, then fill the spray bottle, and dilute it if it's a concentrated mix. Starting with the dashboard and trim, gently wash down each surface using a small amount of cleaner sprayed onto the cloth. Don't over saturate any surface, and be very careful around electrical switches and the radio head unit. When you're done with each section, wipe it down with a clean dry cloth, and repeat the process if necessary. Use the old toothbrush to gently remove dirt and grit from the gaps in between surfaces. Once you're finished with the dashboard and trim, move onto the seats. If the seats are really dirty you may want to use a dedicated car upholstery cleaner or car seat cleaner. No matter what you use, be careful not to use too much liquid otherwise you may stain the seats (by leaving water marks) and they will take a long time to dry out. To clean, use the horsehair brush to gently agitate the cleaner to help with dried in dirt and stains that can be difficult to remove. The final step is to clean the carpets. I usually vacuum the carpets again, as you may have dislodged dirt and dust when cleaning the dash and seats. Don't forget to vacuum down the sides and underneath the seats too. 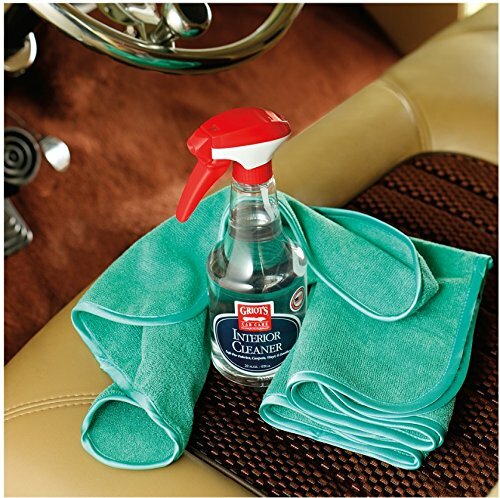 To clean the carpets, spray a moderate amount of car interior cleaner (or car carpet cleaner) across each section. Let it sit for a couple of minutes and then work it into the pile using the horsehair brush. Now wipe it down with a damp clean cloth and let it dry for 15-20 minutes. If the headlining needs cleaning then you can usually use and all purpose cleaner here too. A word of warning: if the headlining is light in color or white DON'T use a cleaner that is colored. There is a good chance it will leave a stain and ruin your headlining. 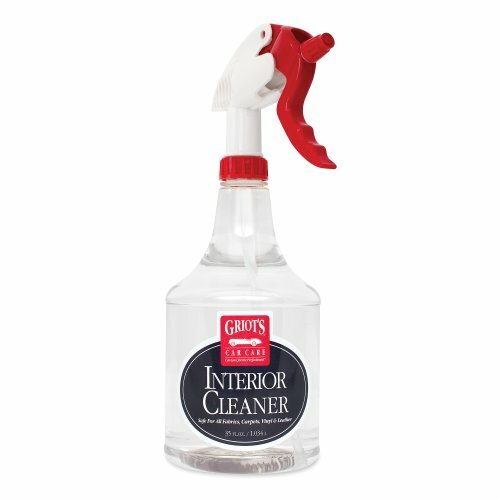 Instead use a clear cleaner, like the Griot's interior cleaner reviewed above. Also I wouldn't recommend rubbing the headlining with anything other than a soft cotton cloth. Many interior cleaners can't be use on glass or clear plastics. I usually use a dedicated glass cleaner for these surfaces, as they give a better finish and won't leave any streaks. Be sure to select a glass cleaner with vinegar in it (or add some if it doesn't). The vinegar is great for leaving a streak free shine! Just like the paintwork on the outside, the interior surfaces will stay looking new longer with regular cleaning. Most interiors are really hard wearing and will stand up to a lot of abuse, but there are a few things you can do too. Clean up heavy spills and dirt as soon as possible. If you've got kids or dogs, then it may be a good idea to invest in some seat covers that can easily be removed and washed. Don't overdo it with the cleaning products. No matter how mild they are, cleaning products will age the surfaces that are used on over time. Sometimes you'll get away with using plain water and a soft brush. Select cleaning products that provide UV protection. If you live in a sunny part of the world your biggest enemy will be UV fade. Using products with UV protection can help to minimise the suns effects especially on surfaces like the dashboard and seats. You can also apply a separate protective coating, but you need to be careful where you use it and how often.